This article is about blood clotting. For other uses, see Coagulation (disambiguation). Coagulation, also known as clotting, is the process by which blood changes from a liquid to a gel, forming a blood clot. It potentially results in hemostasis, the cessation of blood loss from a damaged vessel, followed by repair. The mechanism of coagulation involves activation, adhesion and aggregation of platelets, as well as deposition and maturation of fibrin. Coagulation begins almost instantly after an injury to the blood vessel has damaged the endothelium lining the blood vessel. Exposure of blood to the subendothelial space initiates two processes: changes in platelets, and the exposure of subendothelial tissue factor to plasma Factor VII, which ultimately leads to cross-linked fibrin formation. Platelets immediately form a plug at the site of injury; this is called primary hemostasis. Secondary hemostasis occurs simultaneously: additional coagulation (clotting) factors beyond Factor VII (listed below) respond in a cascade to form fibrin strands, which strengthen the platelet plug. Disorders of coagulation are disease states which can result in bleeding - hemorrhage or bruising - or obstructive clotting - thrombosis. Coagulation is highly conserved throughout biology. In all mammals, coagulation involves both a cellular (platelet) and a protein (coagulation factor) component. The system in humans has been the most extensively researched and is the best understood. The interaction of vWF and GP1b alpha. The GP1b receptor on the surface of platelets allows the platelet to bind to vWF, which is exposed upon damage to vasculature. 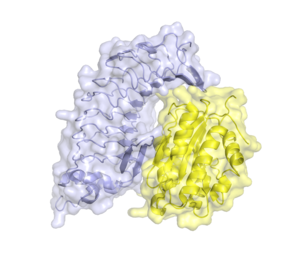 The vWF A1 domain (yellow) interacts with the extracellular domain of GP1ba (blue). When the endothelium is damaged, the normally isolated, underlying collagen is exposed to circulating platelets, which bind directly to collagen with collagen-specific glycoprotein Ia/IIa surface receptors. This adhesion is strengthened further by von Willebrand factor (vWF), which is released from the endothelium and from platelets; vWF forms additional links between the platelets' glycoprotein Ib/IX/V and the collagen fibrils. This localization of platelets to the extracellular matrix promotes collagen interaction with platelet glycoprotein VI. Binding of collagen to glycoprotein VI triggers a signaling cascade that results in activation of platelet integrins. Activated integrins mediate tight binding of platelets to the extracellular matrix. This process adheres platelets to the site of injury. Activated platelets release the contents of stored granules into the blood plasma. The granules include ADP, serotonin, platelet-activating factor (PAF), vWF, platelet factor 4, and thromboxane A2 (TXA2), which, in turn, activate additional platelets. The granules' contents activate a Gq-linked protein receptor cascade, resulting in increased calcium concentration in the platelets' cytosol. The calcium activates protein kinase C, which, in turn, activates phospholipase A2 (PLA2). PLA2 then modifies the integrin membrane glycoprotein IIb/IIIa, increasing its affinity to bind fibrinogen. The activated platelets change shape from spherical to stellate, and the fibrinogen cross-links with glycoprotein IIb/IIIa aid in aggregation of adjacent platelets (completing primary hemostasis). Modern coagulation pathway. Hand-drawn composite from similar drawings presented by Professor Dzung Le, MD, PhD, at UCSD Clinical Chemistry conferences on 14 and 21 October 2014. Original schema from Introduction to Hematology by Samuel I. Rapaport. 2nd edition;Lippencott:1987. Dr Le added the factor XI portion based on a paper from about year 2000. Dr Le's similar drawings presented the development of this cascade over 6 frames, like a comic. 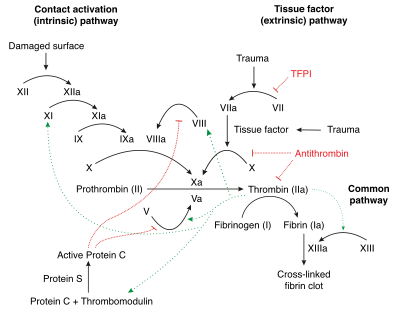 The coagulation cascade of secondary hemostasis has two initial pathways which lead to fibrin formation. These are the contact activation pathway (also known as the intrinsic pathway), and the tissue factor pathway (also known as the extrinsic pathway), which both lead to the same fundamental reactions that produce fibrin. It was previously thought that the two pathways of coagulation cascade were of equal importance, but it is now known that the primary pathway for the initiation of blood coagulation is the tissue factor (extrinsic) pathway. The pathways are a series of reactions, in which a zymogen (inactive enzyme precursor) of a serine protease and its glycoprotein co-factor are activated to become active components that then catalyze the next reaction in the cascade, ultimately resulting in cross-linked fibrin. Coagulation factors are generally indicated by Roman numerals, with a lowercase a appended to indicate an active form. The coagulation factors are generally serine proteases (enzymes), which act by cleaving downstream proteins. The exceptions are tissue factor, FV, FVIII, FXIII. Tissue factor, FV and FVIII are glycoproteins, and Factor XIII is a transglutaminase. The coagulation factors circulate as inactive zymogens. The coagulation cascade is therefore classically divided into three pathways. The tissue factor and contact activation pathways both activate the "final common pathway" of factor X, thrombin and fibrin. 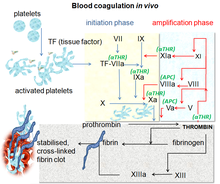 Thrombin then activates other components of the coagulation cascade, including FV and FVIII (which forms a complex with FIX), and activates and releases FVIII from being bound to vWF. The contact activation pathway begins with formation of the primary complex on collagen by high-molecular-weight kininogen (HMWK), prekallikrein, and FXII (Hageman factor). Prekallikrein is converted to kallikrein and FXII becomes FXIIa. FXIIa converts FXI into FXIa. Factor XIa activates FIX, which with its co-factor FVIIIa form the tenase complex, which activates FX to FXa. The minor role that the contact activation pathway has in initiating clot formation can be illustrated by the fact that patients with severe deficiencies of FXII, HMWK, and prekallikrein do not have a bleeding disorder. Instead, contact activation system seems to be more involved in inflammation, and innate immunity. Despite this, interference with the pathway may confer protection against thrombosis without a significant bleeding risk. The division of coagulation in two pathways is mainly artificial, it originates from laboratory tests in which clotting times were measured after the clotting was initiated by glass (intrinsic pathway) or by thromboplastin (a mix of tissue factor and phospholipids). In fact thrombin is present from the very beginning, already when platelets are making the plug. Thrombin has a large array of functions, not only the conversion of fibrinogen to fibrin, the building block of a hemostatic plug. In addition, it is the most important platelet activator and on top of that it activates Factors VIII and V and their inhibitor protein C (in the presence of thrombomodulin), and it activates Factor XIII, which forms covalent bonds that crosslink the fibrin polymers that form from activated monomers. Following activation by the contact factor or tissue factor pathways, the coagulation cascade is maintained in a prothrombotic state by the continued activation of FVIII and FIX to form the tenase complex, until it is down-regulated by the anticoagulant pathways. Calcium and phospholipid (a platelet membrane constituent) are required for the tenase and prothrombinase complexes to function. Calcium mediates the binding of the complexes via the terminal gamma-carboxy residues on FXa and FIXa to the phospholipid surfaces expressed by platelets, as well as procoagulant microparticles or microvesicles shed from them. Calcium is also required at other points in the coagulation cascade. Vitamin K is an essential factor to a hepatic gamma-glutamyl carboxylase that adds a carboxyl group to glutamic acid residues on factors II, VII, IX and X, as well as Protein S, Protein C and Protein Z. In adding the gamma-carboxyl group to glutamate residues on the immature clotting factors Vitamin K is itself oxidized. Another enzyme, Vitamin K epoxide reductase, (VKORC) reduces vitamin K back to its active form. Vitamin K epoxide reductase is pharmacologically important as a target of anticoagulant drugs warfarin and related coumarins such as acenocoumarol, phenprocoumon, and dicumarol. These drugs create a deficiency of reduced vitamin K by blocking VKORC, thereby inhibiting maturation of clotting factors. Vitamin K deficiency from other causes (e.g., in malabsorption) or impaired vitamin K metabolism in disease (e.g., in liver failure) lead to the formation of PIVKAs (proteins formed in vitamin K absence) which are partially or totally non-gamma carboxylated, affecting the coagulation factors' ability to bind to phospholipid. Coagulation with arrows for negative and positive feedback. Protein C is a major physiological anticoagulant. It is a vitamin K-dependent serine protease enzyme that is activated by thrombin into activated protein C (APC). Protein C is activated in a sequence that starts with Protein C and thrombin binding to a cell surface protein thrombomodulin. Thrombomodulin binds these proteins in such a way that it activates Protein C. The activated form, along with protein S and a phospholipid as cofactors, degrades FVa and FVIIIa. Quantitative or qualitative deficiency of either (protein C or protein S) may lead to thrombophilia (a tendency to develop thrombosis). Impaired action of Protein C (activated Protein C resistance), for example by having the "Leiden" variant of Factor V or high levels of FVIII also may lead to a thrombotic tendency. Antithrombin is a serine protease inhibitor (serpin) that degrades the serine proteases: thrombin, FIXa, FXa, FXIa, and FXIIa. It is constantly active, but its adhesion to these factors is increased by the presence of heparan sulfate (a glycosaminoglycan) or the administration of heparins (different heparinoids increase affinity to FXa, thrombin, or both). Quantitative or qualitative deficiency of antithrombin (inborn or acquired, e.g., in proteinuria) leads to thrombophilia. Tissue factor pathway inhibitor (TFPI) limits the action of tissue factor (TF). It also inhibits excessive TF-mediated activation of FVII and FX. Plasmin is generated by proteolytic cleavage of plasminogen, a plasma protein synthesized in the liver. This cleavage is catalyzed by tissue plasminogen activator (t-PA), which is synthesized and secreted by endothelium. Plasmin proteolytically cleaves fibrin into fibrin degradation products that inhibit excessive fibrin formation. Prostacyclin (PGI2) is released by endothelium and activates platelet Gs protein-linked receptors. This, in turn, activates adenylyl cyclase, which synthesizes cAMP. cAMP inhibits platelet activation by decreasing cytosolic levels of calcium and, by doing so, inhibits the release of granules that would lead to activation of additional platelets and the coagulation cascade. Eventually, blood clots are reorganised and resorbed by a process termed fibrinolysis. The main enzyme responsible for this process (plasmin) is regulated by various activators and inhibitors. The coagulation system overlaps with the immune system. Coagulation can physically trap invading microbes in blood clots. Also, some products of the coagulation system can contribute to the innate immune system by their ability to increase vascular permeability and act as chemotactic agents for phagocytic cells. In addition, some of the products of the coagulation system are directly antimicrobial. For example, beta-lysine, an amino acid produced by platelets during coagulation, can cause lysis of many Gram-positive bacteria by acting as a cationic detergent. Many acute-phase proteins of inflammation are involved in the coagulation system. In addition, pathogenic bacteria may secrete agents that alter the coagulation system, e.g. coagulase and streptokinase. Common: aPTT, PT (also used to determine INR), fibrinogen testing (often by the Clauss method), platelet count, platelet function testing (often by PFA-100), thrombodynamics test. Other: TCT, bleeding time, mixing test (whether an abnormality corrects if the patient's plasma is mixed with normal plasma), coagulation factor assays, antiphospholipid antibodies, D-dimer, genetic tests (e.g. factor V Leiden, prothrombin mutation G20210A), dilute Russell's viper venom time (dRVVT), miscellaneous platelet function tests, thromboelastography (TEG or Sonoclot), euglobulin lysis time (ELT). The contact activation (intrinsic) pathway is initiated by activation of the "contact factors" of plasma, and can be measured by the activated partial thromboplastin time (aPTT) test. The tissue factor (extrinsic) pathway is initiated by release of tissue factor (a specific cellular lipoprotein), and can be measured by the prothrombin time (PT) test. PT results are often reported as ratio (INR value) to monitor dosing of oral anticoagulants such as warfarin. The quantitative and qualitative screening of fibrinogen is measured by the thrombin clotting time (TCT). Measurement of the exact amount of fibrinogen present in the blood is generally done using the Clauss method for fibrinogen testing. Many analysers are capable of measuring a "derived fibrinogen" level from the graph of the Prothrombin time clot. If a coagulation factor is part of the contact activation or tissue factor pathway, a deficiency of that factor will affect only one of the tests: Thus hemophilia A, a deficiency of factor VIII, which is part of the contact activation pathway, results in an abnormally prolonged aPTT test but a normal PT test. The exceptions are prothrombin, fibrinogen, and some variants of FX that can be detected only by either aPTT or PT. If an abnormal PT or aPTT is present, additional testing will occur to determine which (if any) factor is present as aberrant concentrations. Deficiencies of fibrinogen (quantitative or qualitative) will affect all screening tests. Coagulation defects may cause hemorrhage or thrombosis, and occasionally both, depending on the nature of the defect. Platelet conditions may be congenital or acquired. Some inborn platelet pathologies are Glanzmann's thrombasthenia, Bernard-Soulier syndrome (abnormal glycoprotein Ib-IX-V complex), gray platelet syndrome (deficient alpha granules), and delta storage pool deficiency (deficient dense granules). Most are rare conditions. Most inborn platelet pathologies predispose to hemorrhage. Von Willebrand disease is due to deficiency or abnormal function of von Willebrand factor, and leads to a similar bleeding pattern; its milder forms are relatively common. Decreased platelet numbers may be due to various causes, including insufficient production (e.g., in myelodysplastic syndrome or other bone marrow disorders), destruction by the immune system (immune thrombocytopenic purpura/ITP), and consumption due to various causes (thrombotic thrombocytopenic purpura/TTP, hemolytic-uremic syndrome/HUS, paroxysmal nocturnal hemoglobinuria/PNH, disseminated intravascular coagulation/DIC, heparin-induced thrombocytopenia/HIT). Most consumptive conditions lead to platelet activation, and some are associated with thrombosis. The best-known coagulation factor disorders are the hemophilias. The three main forms are hemophilia A (factor VIII deficiency), hemophilia B (factor IX deficiency or "Christmas disease") and hemophilia C (factor XI deficiency, mild bleeding tendency). Hemophilia A and B are X-linked recessive disorders, whereas Hemophilia C is a much more rare autosomal recessive disorder most commonly seen in Ashkenazi Jews. Von Willebrand disease (which behaves more like a platelet disorder except in severe cases), is the most common hereditary bleeding disorder and is characterized as being inherited autosomal recessive or dominant. In this disease, there is a defect in von Willebrand factor (vWF), which mediates the binding of glycoprotein Ib (GPIb) to collagen. This binding helps mediate the activation of platelets and formation of primary hemostasis. Bernard-Soulier syndrome is a defect or deficiency in GPIb. GPIb, the receptor for vWF, can be defective and lead to lack of primary clot formation (primary hemostasis) and increased bleeding tendency. This is an autosomal recessive inherited disorder. Thrombasthenia of Glanzmann and Naegeli (Glanzmann thrombasthenia) is extremely rare. It is characterized by a defect in GPIIb/IIIa fibrinogen receptor complex. When GPIIb/IIIa receptor is dysfunctional, fibrinogen cannot cross-link platelets, which inhibits primary hemostasis. This is an autosomal recessive inherited disorder. In liver failure (acute and chronic forms), there is insufficient production of coagulation factors by the liver; this may increase bleeding risk. Deficiency of Vitamin K may also contribute to bleeding disorders because clotting factor maturation depends on Vitamin K.
Thrombosis is the pathological development of blood clots. These clots may break free and become mobile, forming an embolus or grow to such a size that occludes the vessel in which it developed. An embolism is said to occur when the thrombus (blood clot) becomes a mobile embolus and migrates to another part of the body, interfering with blood circulation and hence impairing organ function downstream of the occlusion. This causes ischemia and often leads to ischemic necrosis of tissue. Most cases of venous thrombosis are due to acquired states (older age, surgery, cancer, immobility) or inherited thrombophilias (e.g., antiphospholipid syndrome, factor V Leiden, and various other genetic deficiencies or variants). Mutations in factor XII have been associated with an asymptomatic prolongation in the clotting time and possibly a tendency toward thrombophlebitis. Other mutations have been linked with a rare form of hereditary angioedema (type III) essentialism. Coagulation factor concentrates are used to treat hemophilia, to reverse the effects of anticoagulants, and to treat bleeding in patients with impaired coagulation factor synthesis or increased consumption. Prothrombin complex concentrate, cryoprecipitate and fresh frozen plasma are commonly used coagulation factor products. Recombinant activated human factor VII is increasingly popular in the treatment of major bleeding. Rivaroxaban drug bound to the coagulation factor Xa. The drug prevents this protein from activating the coagulation pathway by inhibiting its enzymatic activity. Anticoagulants and anti-platelet agents are amongst the most commonly used medications. Anti-platelet agents include aspirin, dipyridamole, ticlopidine, clopidogrel, ticagrelor and prasugrel; the parenteral glycoprotein IIb/IIIa inhibitors are used during angioplasty. Of the anticoagulants, warfarin (and related coumarins) and heparin are the most commonly used. Warfarin affects the vitamin K-dependent clotting factors (II, VII, IX, X) and protein C and protein S, whereas heparin and related compounds increase the action of antithrombin on thrombin and factor Xa. A newer class of drugs, the direct thrombin inhibitors, is under development; some members are already in clinical use (such as lepirudin). Also under development are other small molecular compounds that interfere directly with the enzymatic action of particular coagulation factors (e.g., rivaroxaban, dabigatran, apixaban). Theories on the coagulation of blood have existed since antiquity. Physiologist Johannes Müller (1801–1858) described fibrin, the substance of a thrombus. Its soluble precursor, fibrinogen, was thus named by Rudolf Virchow (1821–1902), and isolated chemically by Prosper Sylvain Denis (1799–1863). Alexander Schmidt suggested that the conversion from fibrinogen to fibrin is the result of an enzymatic process, and labeled the hypothetical enzyme "thrombin" and its precursor "prothrombin". Arthus discovered in 1890 that calcium was essential in coagulation. Platelets were identified in 1865, and their function was elucidated by Giulio Bizzozero in 1882. The theory that thrombin is generated by the presence of tissue factor was consolidated by Paul Morawitz in 1905. At this stage, it was known that thrombokinase/thromboplastin (factor III) is released by damaged tissues, reacting with prothrombin (II), which, together with calcium (IV), forms thrombin, which converts fibrinogen into fibrin (I). The remainder of the biochemical factors in the process of coagulation were largely discovered in the 20th century. A first clue as to the actual complexity of the system of coagulation was the discovery of proaccelerin (initially and later called Factor V) by Paul Owren (1905–1990) in 1947. He also postulated its function to be the generation of accelerin (Factor VI), which later turned out to be the activated form of V (or Va); hence, VI is not now in active use. Factor VII (also known as serum prothrombin conversion accelerator or proconvertin, precipitated by barium sulfate) was discovered in a young female patient in 1949 and 1951 by different groups. Factor VIII turned out to be deficient in the clinically recognised but etiologically elusive hemophilia A; it was identified in the 1950s and is alternatively called antihemophilic globulin due to its capability to correct hemophilia A. Factor IX was discovered in 1952 in a young patient with hemophilia B named Stephen Christmas (1947–1993). His deficiency was described by Dr. Rosemary Biggs and Professor R.G. MacFarlane in Oxford, UK. The factor is, hence, called Christmas Factor. Christmas lived in Canada, and campaigned for blood transfusion safety until succumbing to transfusion-related AIDS at age 46. An alternative name for the factor is plasma thromboplastin component, given by an independent group in California. Hageman factor, now known as factor XII, was identified in 1955 in an asymptomatic patient with a prolonged bleeding time named of John Hageman. Factor X, or Stuart-Prower factor, followed, in 1956. This protein was identified in a Ms. Audrey Prower of London, who had a lifelong bleeding tendency. In 1957, an American group identified the same factor in a Mr. Rufus Stuart. Factors XI and XIII were identified in 1953 and 1961, respectively. The view that the coagulation process is a "cascade" or "waterfall" was enunciated almost simultaneously by MacFarlane in the UK and by Davie and Ratnoff in the USA, respectively. The usage of Roman numerals rather than eponyms or systematic names was agreed upon during annual conferences (starting in 1955) of hemostasis experts. In 1962, consensus was achieved on the numbering of factors I-XII. This committee evolved into the present-day International Committee on Thrombosis and Hemostasis (ICTH). Assignment of numerals ceased in 1963 after the naming of Factor XIII. The names Fletcher Factor and Fitzgerald Factor were given to further coagulation-related proteins, namely prekallikrein and high-molecular-weight kininogen, respectively. Factors III and VI are unassigned, as thromboplastin was never identified, and actually turned out to consist of ten further factors, and accelerin was found to be activated Factor V.
All mammals have an extremely closely related blood coagulation process, using a combined cellular and serine protease process. In fact, it is possible for any mammalian coagulation factor to "cleave" its equivalent target in any other mammal. The only non-mammalian animal known to use serine proteases for blood coagulation is the horseshoe crab. ^ Furie B, Furie BC (2005). "Thrombus formation in vivo". J. Clin. Invest. 115 (12): 3355–62. doi:10.1172/JCI26987. PMC 1297262. PMID 16322780. ^ David Lillicrap; Nigel Key; Michael Makris; Denise O'Shaughnessy (2009). Practical Hemostasis and Thrombosis. Wiley-Blackwell. pp. 1–5. ISBN 978-1-4051-8460-1. ^ Alan D. Michelson (26 October 2006). Platelets. Academic Press. pp. 3–5. ISBN 978-0-12-369367-9. Retrieved 18 October 2012. ^ Schmaier, Alvin H.; Lazarus, Hillard M. (2011). Concise guide to hematology. Chichester, West Sussex, UK: Wiley-Blackwell. p. 91. ISBN 978-1-4051-9666-6. ^ Nigel Key; Michael Makris; et al. (2009). Practical Hemostasis and Thrombosis. Wiley-Blackwell. p. 2. ISBN 978-1-4051-8460-1. ^ Pallister CJ, Watson MS (2010). Haematology. Scion Publishing. pp. 334–336. ISBN 978-1-904842-39-2. ^ a b c d e f g Pallister CJ, Watson MS (2010). Haematology. Scion Publishing. pp. 336–347. ISBN 978-1-904842-39-2. ^ "COAGULATION FACTOR". Clotbase.bicnirrh.res.in. Retrieved 20 May 2018. ^ Hoffbrand, A. V. (2002). Essential haematology. Oxford: Blackwell Science. pp. 241–243. ISBN 978-0-632-05153-3. ^ a b Long, Andrew T.; Kenne, Ellinor; Jung, Roman; Fuchs, Tobias A.; Renné, Thomas (2015). "Contact system revisited: An interface between inflammation, coagulation, and innate immunity". Journal of Thrombosis and Haemostasis. 14 (3): 427–437. doi:10.1111/jth.13235. PMID 26707513. ^ a b Hoffbrand, A. V. (2002). Essential haematology. Oxford: Blackwell Science. pp. 243–245. ISBN 978-0-632-05153-3. ^ David Lillicrap; Nigel Key; Michael Makris; Denise O'Shaughnessy (2009). Practical Hemostasis and Thrombosis. Wiley-Blackwell. pp. 7–16. ISBN 978-1-4051-8460-1. ^ Hatton, Chris (2008). Haematology (Lecture Notes). Cambridge, MA: Blackwell Publishers. pp. 145–166. ISBN 978-1-4051-8050-4. ^ Soff GA (March 2012). "A new generation of oral direct anticoagulants". Arteriosclerosis, Thrombosis, and Vascular Biology. 32 (3): 569–74. doi:10.1161/ATVBAHA.111.242834. PMID 22345595. ^ Schmidt A (1872). "Neue Untersuchungen über die Faserstoffgerinnung". Pflügers Archiv für die gesamte Physiologie. 6: 413–538. doi:10.1007/BF01612263. ^ Schmidt A. Zur Blutlehre. Leipzig: Vogel, 1892. ^ Arthus M, Pagès C (1890). "Nouvelle theorie chimique de la coagulation du sang". Arch Physiol Norm Pathol. 5: 739–46. ^ Shapiro SS (2003). "Treating thrombosis in the 21st century". N. Engl. J. Med. 349 (18): 1762–4. doi:10.1056/NEJMe038152. PMID 14585945. ^ Brewer DB (2006). "Max Schultze (1865), G. Bizzozero (1882) and the discovery of the platelet". Br. J. Haematol. 133 (3): 251–8. doi:10.1111/j.1365-2141.2006.06036.x. PMID 16643426. ^ Morawitz P (1905). "Die Chemie der Blutgerinnung". Ergebn Physiol. 4: 307–422. doi:10.1007/BF02321003. ^ a b c d e f Giangrande PL (2003). "Six characters in search of an author: the history of the nomenclature of coagulation factors". Br. J. Haematol. 121 (5): 703–12. doi:10.1046/j.1365-2141.2003.04333.x. PMID 12780784. ^ MacFarlane RG (1964). "An enzyme cascade in the blood clotting mechanism, and its function as a biochemical amplifier". Nature. 202 (4931): 498–9. Bibcode:1964Natur.202..498M. doi:10.1038/202498a0. PMID 14167839. ^ Davie EW, Ratnoff OD (1964). "Waterfall sequence for intrinsic blood clotting". Science. 145 (3638): 1310–2. Bibcode:1964Sci...145.1310D. doi:10.1126/science.145.3638.1310. PMID 14173416. ^ Wright IS (1962). "The Nomenclature of Blood Clotting Factors". Can Med Assoc J. 86 (8): 373–4. PMC 1848865. PMID 14008442. ^ Osaki T, Kawabata S (June 2004). "Structure and function of coagulogen, a clottable protein in horseshoe crabs". Cellular and Molecular Life Sciences : CMLS. 61 (11): 1257–65. doi:10.1007/s00018-004-3396-5. PMID 15170505. Hoffman, M; Monroe DM, 3rd (June 2001). "A cell-based model of hemostasis". Thrombosis and Haemostasis. 85 (6): 958–65. doi:10.1055/s-0037-1615947. PMID 11434702. Hoffman, Maureane; Monroe, Dougald M. (2007). "Coagulation 2006: A Modern View of Hemostasis". Hematology/Oncology Clinics of North America. 21 (1): 1–11. doi:10.1016/j.hoc.2006.11.004. PMID 17258114. This page was last edited on 23 April 2019, at 21:12 (UTC).